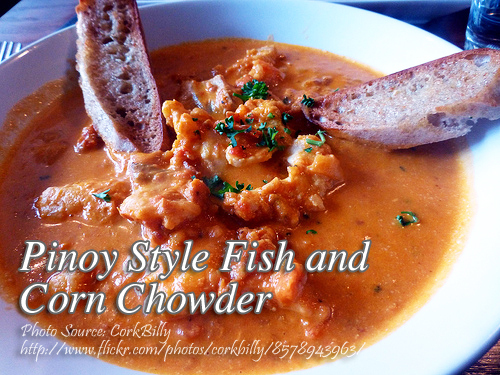 Fish and corn chowder is a foreign dish but the ingredients are adapted to a Pinoy cuisine. One obvious ingredient is the malunggay leaves. Chowder is very similar to soup but it is a thick soup and cream based. Chowder is usually a vegetable and seafood thick soup. On this recipe, you can use a lean fish fillet like cream dory or labahita (surgeon fish) fillets. To cook Pinoy style fish and corn chowder; Melt margarine in a saucepan. Add in flour and stir in milk gradually until slightly thick. Set aside. Heat margarine or oil and saute garlic and onions until soft. Add the corn and fish then pour in water and season with salt and pepper. Simmer for about 20 minutes. Then add carrots and tomato sauce. Simmer for another 10 minutes. Then stir in the flour mixture. Stir cook until slightly thick then add the malunggay leaves then simmer for 5 minutes more. Serve hot and garnish with spring onions. Melt margarine in a saucepan. Add in flour and stir in milk gradually until slightly thick. Set aside. Heat margarine or oil and saute garlic and onions until soft. Add the corn and fish then pour in water and season with salt and pepper. Simmer for about 20 minutes. Then add carrots and tomato sauce. Simmer for another 10 minutes. Then stir in the flour mixture. Stir cook until slightly thick then add the malunggay leaves then simmer for 5 minutes more.